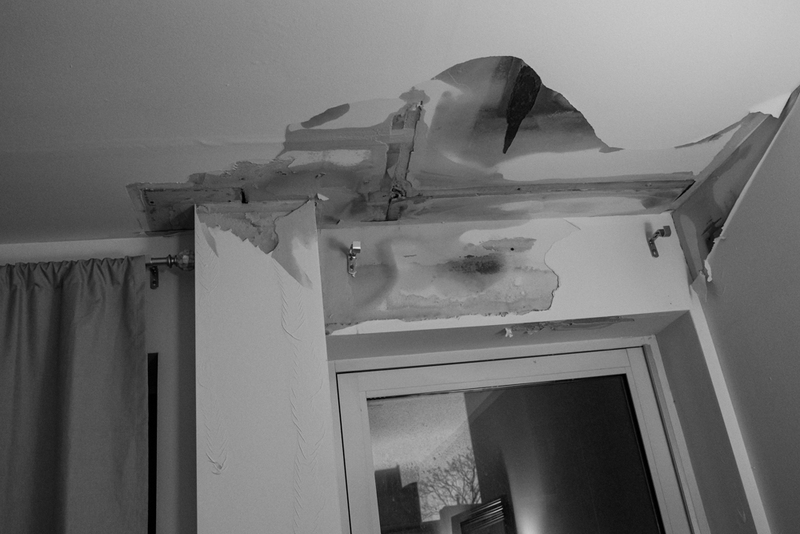 It isn't everyday that you get a call from your landlord saying, "A water valve busted in the apartment above yours' and we can't tell if it has leaked into your apartment." The landlord said the leak was above the bedroom so I quickly tried to visualize what was on the floor and the first thing that came to mind was my camera bag. On that note, I hopped into a cab and headed home. When I got there I could see where the water had run down the side of the building and all the balconies from the 3rd floor down were covered in icicles. Upon entering my apartment, I was at first relieved that my dog Buddy was ok and not doggie paddling around the apartment, and then really relieved to find that the water was contained to a corner of the bedroom. Luckily a chair, that was covered in a stack of extra blankets and towels, was strategically placed right beneath the leak and had absorbed probably 90% of the water! Below are some of the pictures from the scene of the leak. The water that ran down the walls formed some pretty cool looking bubble trails.